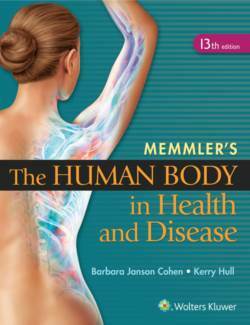 Prepare your students for success in their allied health careers with Memmler's The Human Body in Health and Disease, 13e. Acclaimed for its innovations in pedagogy and approach, the book has already helped hundreds of thousands of allied health students (including those with little or no background in science and/or weak language skills) to master the content of the course. From its pioneering use of phonetic pronunciations to its pedagogically effective skin-to-bone transparencies of the human body, to this edition's new personalized chapter-by-chapter quizzes powered by prepU; this book continues to set the standard for the one-semester course. Continuing the tradition of excellence that has made the book a classic, this edition prepares students for success in their healthcare careers through easy-to-understand, beautifully illustrated coverage of the essentials of human anatomy, physiology, and the effects of disease. Throughout the book, anatomical art illustrates concepts with accuracy, simplicity, and elegance; medical case studies enhanced with additional clinical content demonstrate the relevance of the content to a career in the health professions; and unique pedagogy helps students master the anatomic and medical terminology they will encounter in healthcare settings. Now more engaging, easier to learn from, and easier to remember than ever before, the Thirteenth Edition features a clear, friendly writing style; a dramatically enhanced design, photo, and art program; a wide array of in-text and online learning tools tailored to the needs of allied health students; and an unparalleled suite of instructor and student resources designed to save you time and help your students succeed.